Are Tin Cans Attracted to a Magnet? Can Aluminum Be Heated & Bent? While some people refer to tin cans and aluminum cans interchangeably, the two types of cans are not the same thing. People use tin cans and aluminum cans for the same general purposes; however, the two items are made from different materials and have different properties and manufacturing costs. Cans have been an efficient storage container since 1810, when the tin can was patented. Aluminum cans were not available until 1965. Aluminum and tin cans have many uses, but are probably most known for containing and preserving food. Both types of cans protect food from light and air, are durable and are recyclable. Tin is a low-melting crystalline metallic element that is malleable at room temperature. Tin is typically extracted from a mineral called cassiterite, a compound of tin and oxygen. Tin's basic refining process makes it appealing for manufacturing. Tin also does not corrode easily, which is why it is useful for cans. A modern tin can is actually made from steel coated with a very thin layer of tin to prevent the steel from corroding. Aluminum is also a metallic element. Unlike tin, which only makes up 0.001 percent of Earth's crust, aluminum is abundant, making up 8.2 percent. However, aluminum is much more difficult to refine and is always found in compounds in nature, usually potassium aluminum sulfate or aluminum oxide. Different processes have been developed over time to refine aluminum, each increasingly more efficient. Aluminum cans are made from alloys of aluminum, and these alloys are notable for being strong and very lightweight. 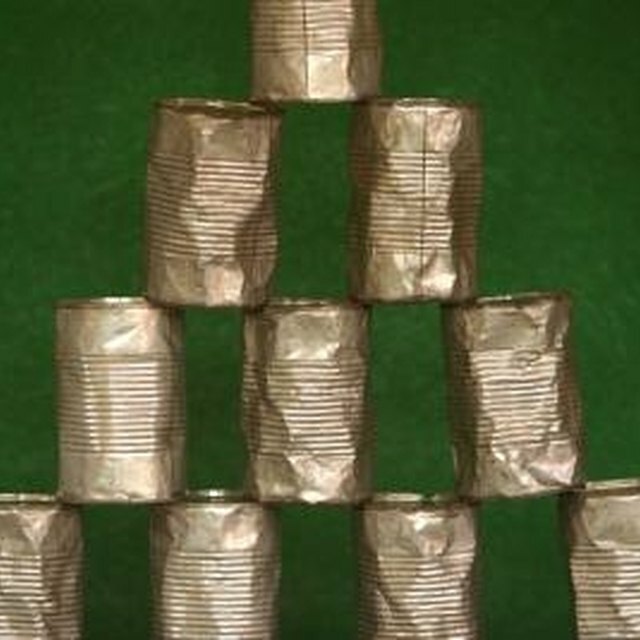 Tin cans are heavier than aluminum cans and are more durable. Tin cans are also highly resistant to the corrosive properties of acidic foods, like tomatoes. However, tin cans are less efficient for recycling than aluminum. The money saved from recycling aluminum rather than processing new aluminum is enough to pay to recycle and collect aluminum cans, and is enough to help cover the costs of recycling containers that are more difficult to process, such as plastic and glass. What Is the Most Abundant Metal on Earth? Leggett, Rochelle. "The Difference Between Aluminum & Tin Can." Sciencing, https://sciencing.com/difference-between-aluminum-tin-can-8596036.html. 13 March 2018. What Are Tin Cans Made Of?